A continent of extremes, South America is home to icy backdrops, blissful beaches, dense rainforests and rolling mountain ranges. Factor in the vibrant cities, relics of ancient civilizations and unmissable sights and it’s easy to see why this part of the world is a must-see for travellers with adventurous spirits. Read on for five awe-inspiring destinations to add to your bucket list. As the host of the Rio 2016 Olympics, Brazil is set to be one of the summer’s most popular destinations. If you’re making your way to watch the games in August, it would be a shame to miss out on everything else the city has to offer. Our top pick? 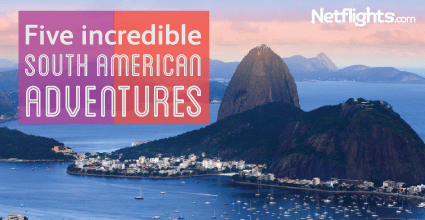 Catching a cable car to the top of Sugar Loaf Mountain and feasting your eyes on spectacular view of the city below, the Christ statue, Guanabara Bay and the area’s neighbouring beaches, forests and mountains. The iconic Incan city of Machu Picchu remains one of the ultimate things-to-see for many visitors to South America. However beyond the world-famous ancient citadel, the city of Cusco provides the perfect gateway to begin your exploration of the region. Whether on foot, by rail or by car, you’re in a prime position to discover the peaks of the Andes Mountains, the Sacred Valley and Amazonian valleys dotted with villages and breath-taking natural attractions. Before setting off on your trail, take time to walk along the Peruvian city’s cobble stoned streets and try out Cusco’s bars, museums and restaurants. Lying on the border between Brazil and Argentina, the Iguazu Falls are a majestic natural wonder. Easily visited from either of the two countries, each side offers a stunning outlook to view the beauty of the cascading waterfalls. Surrounded by lush rainforest, the area is heaving with wild tapirs, giant anteaters, and howler monkeys. Visitors can follow tours and foot trails through the forest, catch the Rainforest Train or take in the view from a helicopter. Follow in Darwin’s footsteps and explore the stark contrasts of the Galapagos Islands and the many amazing creatures that live there. The UNESCO World Heritage site is a diverse landscape featuring white sandy beaches and rocky enclaves teeming with wildlife that inspired The Origin of the Species. Hike or amble through the Darwin Trail on foot to get up close with finches, flamingos and iguanas. Under the water, dive or snorkel alongside sea lions and sea turtles or get on board with some surf lessons. Set amongst the third largest mass of ice on the planet, The Los Glaciares National Park is home to hundreds of glaciers. However, at 5 km wide and 60 m high, it is the magnificent Perito Moreno Glacier that commands the most attention. Anyone can visit this natural wonder of the world for guided tours or to trek across several different glaciers via the small mountain town of El Chalten.